Europe faces a significant threat which is increasing. If IS takes Syria and creates, in their view, the Caliph, it will go up to a 10 out of 10 on the danger scale. I think we will continue to see these types of lone wolf attacks against European targets, which could be mass casualty. Pravda.Ru interviews international biowarfare expert Jill Bellamy*. 1. Do you think we are being told the whole truth about the fight against Islamic State? I don’t think it’s about the ‘truth’ or not being told the ‘truth’ I think it has to do with acknowledging the reality of the situation on the ground and some parties are reluctant to do so because this would mean defining an end-game strategy and there isn’t one, as the situation exists today. If you recall, there was great hope placed in the so called ‘Arab Spring.’ This has become a disaster and humanitarian tragedy of epic proportions, not only for the Middle East but the West. We are watching the creation of a terrorist state. This is unlike say Somalia which dissolved into a terrorist state. Syria was a stable secular state (an important factor in the Middle East today) and President Assad is a rational state actor. 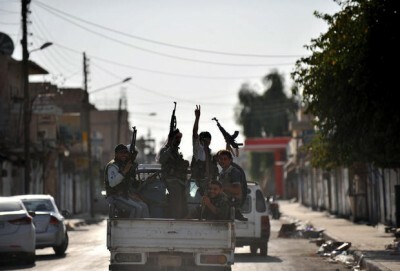 IS has an end-game strategy and that is being successfully implemented. While al Zawahiri, the leader of Al Qaeda may disagree with me on this one, IS for all intents and purposes is a state. It’s a state that’s in the process of swiftly consolidating its power, it has extensive resources, a core leadership, incredibly savvy recruitment program and the time to really make an impact to reverse IS has passed us by about four years ago; when Russia offered to negotiate a peace settlement which would most likely have averted IS taking over strategic points in Syria and Iraq. The focus on removing Bashar al Assad, so over shadowed the real threat to stability and peace (IS) that it obscured strategic planning. I have spent years assessing Syria’s unconventional weapon capabilities, long before Syria was on the radar or at war. I was one of President Assad’s ardent critics when it came to his WMD programs. I worked on areas related to UN Treaty Verification under the BTWC. I think the fear now is a political one for those who insisted President Assad be forced out of office. The meteoric rise of IS due in part to oil revenue, their exceptional command structure and operational capabilities caught the West, I would say completely by surprise. They were used to dealing with Al Qaeda who moved at a more predictable pace and whose leadership was well known and could be targeted. As long as the West continues to underestimate IS they will be unable to contribute to any kind of regional stability and will be fighting IS on the streets of Brussels if they don’t change track soon. If we are going to win against IS, we need Russia and we need them more than they need us. Such admissions may be hard to come by, but as a realist, I believe we need to work with Russia to develop a strategy to keep Syria together, for the peace of that nation, for stability within the Middle East and for international security. It’s too late to avert a humanitarian crisis, which has been on-going for the past three years. Western Europe is only now interested as it’s beginning to affect them but this has been ongoing for a long time and it will only get worse if we fail to coordinate efforts. We need President Assad to maintain command and control over his military, his weapon classes and territory. While it will be very unpopular to suggest this we need to work closely with Russia in order to ensure Damascus doesn’t fall to IS like Raqqa and Mosul. 2. What is the real situation in your opinion? The situation on the ground today is one where terrorist groups are carving up Syria and if we don’t join forces to stop this it will not end at Syria’s door but our own. For both Russia and the West it may mean having to eat humble pie, but if we don’t coordinate now we will see IS setting up camp in Turkey and then in parts of Western Europe. In 2014 when IS took over Dabiq, I believe we conceded Syria to IS. Obviously I’m hoping that Russia can support the Assad government to take it back, but Dabiq has incredible religious and historical relevance, it is the location noted in the hadith that Muslims will fight Christians which will bring the apocalypse. It’s extremely important and we simply ignored Dabiq falling to IS. Our leadership’s lack of intervention at that point gave IS the green light. Bombing IS and trying to do so in ways which still allow it to function and to walk a fine line, so it is somewhat hindered but not really impacted in order to not help or be perceived as helping Pres. Assad is like bleeding out a bull. It will take forever and the results will be human misery and a humanitarian crisis which we are just at the beginning of witnessing here in Europe. If European states don’t want to take in the tens of thousands of refugees now, it’s not going to get better a year from now when IS is running Syria or taking parts of Turkey. Should President Assad lose command and control over his military programs in Damascus, IS will use biological weapons against Syrian civilians like they have used chemical agents. Biological warfare agents don’t discriminate against national boundaries. When IS does this it will again catch the West off guard as they cling to this antiquated idea that terrorists won’t use BW. For Russia, they have fought terrorist factions for years and years in the Caucuses and have experience with routing out terrorist organizations, a capability largely lacking in the West, who’ve not experienced terrorists taking over their actual territory and holding it. They also have vast experience in the region and could well be an accepted mediator, but not as long as IS is in Syria. We need to now go into damage control mode and coordinate with Russia on removing IS from Syria. 3. Why does the West not provide more help to President Assad who is fighting ISIS? I think there remains an ingrained sense of fear due to the first and second Gulf wars. Beyond this, I think Assad was positioned to be ‘the enemy’ and it’s hard to pull back once you’ve named the enemy, built political positions and careers on this and supported in some instances other terror organizations to try to remove him. I think the international community was caught off guard at the meteoric rise of IS. If we could turn back time to the very beginning of the Arab Spring, I expect very different decisions would have been made. We are now too far down the line and too politically entrenched to pull back from the position that Assad is the enemy. This is a position which focuses purely on the short term without any long term planning for Syria. The West may have been planning for Syria “after Assad” with a few terrorist groups to deal with but nothing like IS was on the agenda then. IS creating a State within Syria and Iraq was not considered a viable outcome. Unless we coordinate our efforts, Syria will fall to IS. Other regional powers, even declared enemies of the Syrian State do not want Syria to fall to IS. 4. How credible are the claims that ISIS now has chemical weapons? What appears to be concerning is not just that they have chemical weapons but that they have some capability to manufacture crude CW. It’s highly unlikely they acquired CW from either the Iraq or Syria. CW left in Iraq would no longer be viable as depending on the compound, you must generally replace it on 18 month cycles. The supposed CW stocks they captured in Iraq would no longer be viable. Syrian CW was destroyed and any remaining stocks that were perhaps overlooked would hopefully still be under the command and control of President Assad. This question begs exactly the problem with not supporting President Assad. I’ve worked on the other side with Treaty Verification and the BTWC and what is most concerning is to see a state lose control of this weapon class. It’s not the ‘lesser of two evils’ here for the West. Should Pres. Assad lose control of his defensive biological weapon programs, it will make IS use of CW look like a children’s lab experiment. This keeps me awake at night. Should IS gain control of the SSRC in Damascus we will see the use of biological warfare agents and it would be likely IS will be able to protect themselves. In the event that the obsolete notion that ISIS wouldn’t use BW because they would expose themselves accidently or deliberately is floated, as some kind of inhibitor, it’s not. Blow back is no longer an inhibitor as forces using BW can fully protect themselves and can deploy it in such a way that it will not severely impact their own populations. While ISIS is Sunni, they share an apocalyptic belief similar to the Twelver’s belief that an apocalypse will usher back the Mahdi to the Well at Qum (for Shiite). ISIS believes bringing on the apocalypse will bring the arrival of the Mahdi (not yet born) perhaps to Dabiq. Biological warfare agents, pathogens and toxins do not respect international boundaries. While kill ratios with CW can be fairly accurately calculated, BW is an entirely different weapon class. The use of BW on civilians would mean global pandemics, particularly with modern day air travel, but more specifically with the outpouring of refugees into and through Europe. In most instances the 6 or so Category A agents are transmissible, highly infectious and have lengthy incubation periods, which means from the time of infection one can be A symptomatic, enter a short prodromal phase and then spread disease. It’s possible to genetically amplify virulence (its difficult but it is possible) to increase transmission, so that one case infects many more than you would have in a natural outbreak. You can imagine that a refugee crisis of this proportion would accelerate transmission. We worry about just general disease burden in refugee populations as they are at risk from a number of highly transmissible and infectious diseases, but with a deliberate disease, intentionally meant to infect high numbers, the possibility that an epidemic would go global, increases. In addition to creating epidemics and pandemics, at the tactical level, a military lay down of anthrax could deny territory and advantage IS specifically over other terrorist organizations operating inside Syria. From a BW perspective we need to maintain Assad in power so he can maintain command and control over this research. We may currently be cooperating with Russia in some areas, but we need to expand that cooperation in order to counter the threat IS poses to humanity and this is a much greater, immediate and more serious threat than Assad represents to the West. 5. How near is ISIS to developing biological weapons? I’m very worried about their acquiring a BW capability. We have seen them develop CW almost in a vacuum. If this is anything to go by then BW will not be that far behind. In terms of their CW, if we assume they had no precursors and have not diverted CW stocks, then they are working on this like Al Qaeda did back in the 90’s. It appears they are farther along than was expected with regard to their crude CW manufacturing efforts. I’m sure they are working to refine this and I believe we will see them using other chemical agents against civilians. Military forces can protect themselves generally from CW, so it is the civilians I worry about most. We have seen IS move at light speed when it comes to acquiring and further developing weapons-most of the defence community would have been previously skeptical that IS could develop, manufacture and deploy chemical weapons as a non-state actor. Which says two things: one, they are a state actor, and two, they are interested in and will use WMD. Biological weapons are easier to acquire, produce and deploy than chemical warfare agents. I would be worried that should they acquire something like bacillus anthracis they could use it for territory denial. They could conduct human experiments and film it as a form of intimidation and terror. It would be difficult to imagine after watching numerous videos of beheadings and the horrific death of the Jordanian pilot whom IS set on fire in a cage, that we should not take every action we can to prevent them from acquiring biological warfare agents. Scenarios that involve European transportation are worrying. IS has condemned the exodus of civilians from Syria and if they acquire biological agents, some of which would not need to be weaponized to be used effectively, they could spread disease among refugees either in the camps on the Syrian border or expose captives and release them into the general population. 6. On a level of one to ten, how serious is the threat of an impending massive terrorist strike against the West by ISIS? Europe faces a significant threat which is increasing. Right now I would put it at about a 7. If IS takes Syria and creates, in their view, the Caliph, it will go up to a 10. I think we will continue to see these types of lone wolf attacks against European targets, which could be mass casualty. I do think ISIS at the moment is very focused on consolidating the Caliph and this takes up quite a bit of their operational planning. This is in some contrast too Al Qaeda who was far more focused on international terrorism and less so on creating the Caliph. I think we should discuss IS networks in Europe and understand that as their strength in the Middle East increases, the likelihood we will experience major multi state terrorist attacks increases. While the refugee crisis unfolding in Europe may provide IS with infiltration routes, I believe they already have an established network with a few key operatives here who are in positions to oversee more major attacks after the planning stages develop into more finalized forms. This network has been in place for some time. Like AQ, I believe they’ve designated a number of targets in Europe and I do think our services struggle to keep up with the sheer volume of potential plots. The chance that IS will succeed in planning and carrying out a major attack is fairly good particularly in European states which do not really think terrorism will affect them or deny that IS is really an issue for Europe. Those states are more vulnerable. IS pays attention. They know which states are the most vulnerable and where those vulnerabilities lay. When we suffer lone wolf attacks they watch how the counter operations work. Lack of coordination among some EU states is also an issue which needs urgent review. One of the problems is that smaller European states simply don’t have the resources to deal with IS, so they are dependent upon larger services. This co-dependence has inherent risks which larger states are unlikely to take. We simply do not have the resources to prevent every single attack or threat. The key is stability in the Middle East and reducing their territory and capabilities (be this financial, in terms of their training camps, their weapon classes, recruitment etc.) This will require a coordinated effort. *Dr. S.J. Bellamy is a recognized international expert on biological warfare. She has previously developed and run NATO sponsored policy programs on biological terrorism and has published extensively in related fields. Her papers have appeared in the National Review, The Washington Post, The Washington Times, Le Monde, Le Temps and the Jerusalem Post. Over the past twenty five years she has worked in non-proliferation and contributed to UN Expert Meetings for the Biological and Toxin Weapon Convention. She has developed and run nuclear and biological war games and scenarios supported by European Ministries of Defence. Currently she advises governments on national strategic stockpiling and force protection.